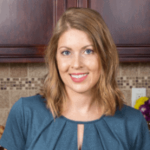 Published: Jul 17, 2015 · Modified: Oct 18, 2018 · By Jen Sobjack · This post may contain affiliate links. 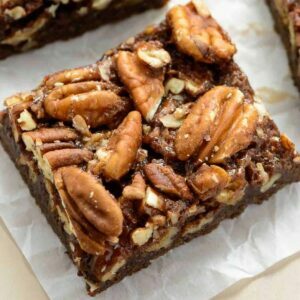 If you like pecan bars, you will go nuts for this bourbon and chocolate version! 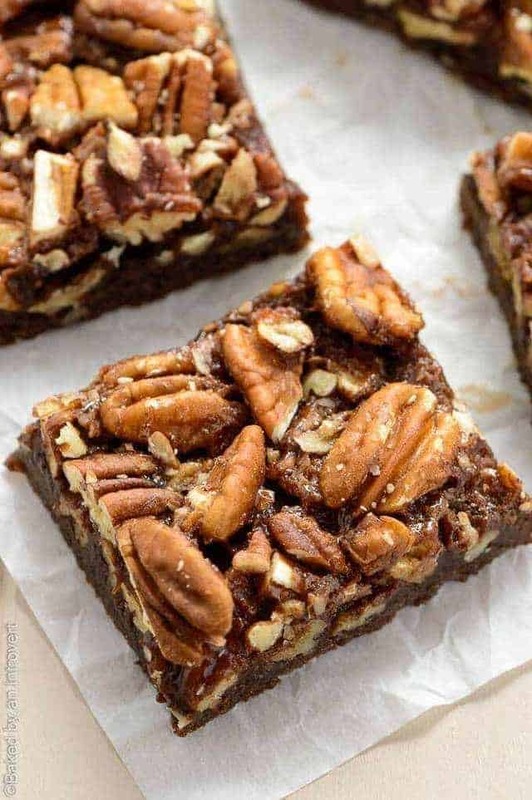 These chocolate bourbon pecan bars are soft, chewy, crunchy, and gooey. They’re unlike any other bar dessert I’ve made. Layering chocolate pecan pie filling, spiked with bourbon, over a chocolate cookie crust will up your pecan bar game. Who knew that all these flavors would be so great together! 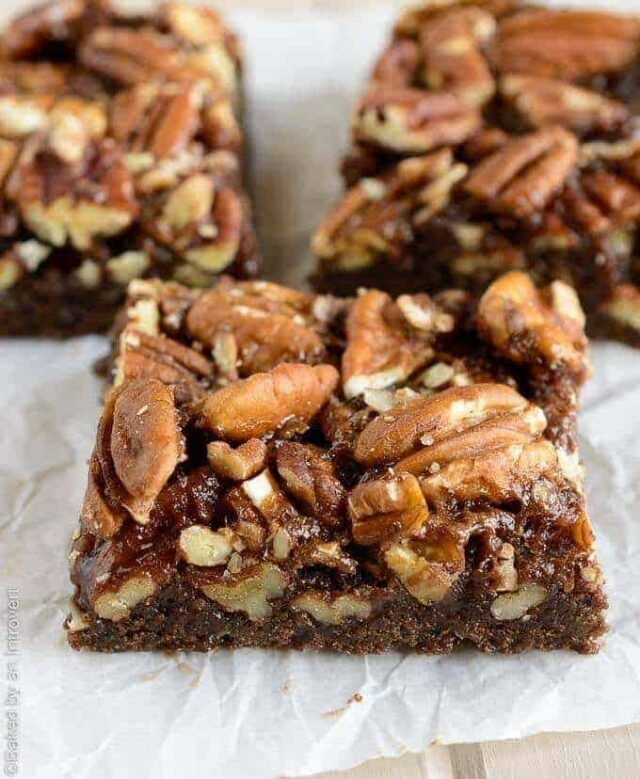 This takes pecan pie bars to a whole new level!! The recipe is so easy. You won’t need to pull out the heavy mixer. Nope, not today – just a couple of bowls and a spatula. I made a fairly small batch in a 9×9-inch baking pan, but I cut the bars rather large. You can always double the recipe or cut them smaller to feed more people if needed. Start by making the chocolate cookie bottom. Simply toss together some flour, sugar, salt, and baking powder. Melt a little butter and mix in some cocoa powder. Then stir the buttery chocolate into the flour. The bottom needs to bake for about 20 minutes so that it’s sturdy enough to hold the gooey topping. Next comes the filling. It’s similar to traditional style pecan pie filling, except I added bourbon and some melted chocolate. You could easily skip the bourbon, but I think it’s vital for flavor. Besides, all the alcohol will get baked out because these decadent bars are going back into the oven. As the bars bake, the filling melds together, holding all the pecans into place; leaving no corner untouched with the sticky sweet filling. Each bar is rich chocolaty goodness. The bars bake for another 25 minutes and will need to cool completely before cutting them. I actually let mine sit overnight. If you’re in a hurry you can cool them on the counter for a few minutes and then pop them into the refrigerator for about 30 minutes. They should be sturdy enough to cut by then. Grab a tall glass of milk and sink your teeth into a soft, buttery, chewy, and crunchy dessert. 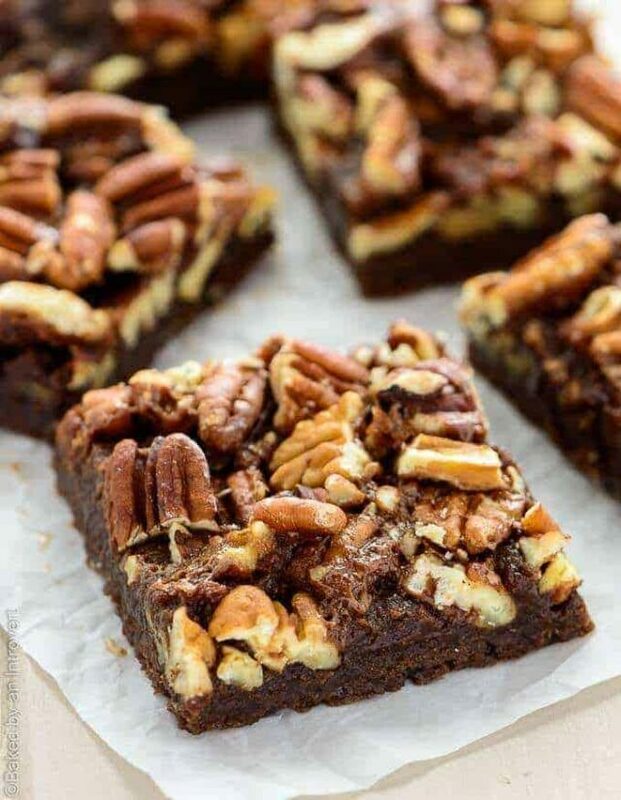 The bourbon pairs nicely with the chocolate and the pecans add such a wonderful texture contrast. Make the crust: Preheat the oven to 350ºF. Line a 9x9-inch baking pan with foil and spray with nonstick spray. Combine the melted butter and cocoa powder in a small bowl. Stir until smooth. In a medium bowl, combine the flour, brown sugar, salt, and baking powder. Stir to combine. Pour chocolate butter mixture into the flour and toss together until evenly mixed. The dough will the thick. Press it evenly into the bottom of the prepared pan. Bake for 20 minutes. While the crust is baking, place butter and chocolate in a large microwave-safe bowl. Microwave on high for 30 seconds. Stir well. If chocolate isn't fully melted, heat in 10-second interval until fully melted. Stir well after each interval. Whisk in the sugar, corn syrup, bourbon, vanilla, and salt until combined. Add the egg and whisk until fully incorporated. Pour the filling over the hot crust. Sprinkle the top with pecans. Bake for 25 minutes or until the edges begin to firm up. (The center will remain wobbly, like it is under done. That is okay. It will firm up as it cools.) Cool the bars completely on a wire rack. Lift the foil out of the pan to remove the bars and transfer to a cutting board. Cut the bars into 16 pieces. The bars need to be cooled completely before cutting. If you are short on time, put them in the refrigerator to speed up the cooling process.